Research shows that the importance of patient-reported outcomes, improved decision support, and care coordination is growing rapidly as new payment models transform healthcare delivery. This has led to the use of new measures and communication techniques, including shared decision-making and motivational interviewing. Using patient-reported outcomes at the point of service helps providers identify what matters most to the patient in front of them now. Describing treatment options and deciphering a patient’s preferences effectively is a process, which has been likened to arriving at a diagnosis. Providers make a medical diagnosis by discerning a patient’s primary complaints, past history, exam findings, and test results. A preference diagnosis can be thought of similarly. Providers work with their patients to identify what matters most to them, discuss the risks and benefits of the available treatment options, and support the patient as needed through the decision-making process. Once informed of their options, patients frequently chose treatments that require modifying their habits. Motivational interviewing helps patients and providers understand what matters most now and design care plans that provide appropriate support. ​While many healthcare providers and leaders may be familiar with patient-reported outcomes from research articles, and have heard of shared decision-making and motivational interviewing, few have experience using them. Fewer still understand how each relates to the other. This book helps leaders and healthcare providers better understand how to use patient-reported data to their advantage at the point of service. The book provides the background for developing shared knowledge and shared language, along with extensive examples of dialogue between providers and patients. In addition, the book contains personal interviews of subject matter experts who have significant experience using these measures. The result is a comprehensive understanding of how these measures and techniques can help providers, organizations, and patients navigate this modern healthcare management opportunity. 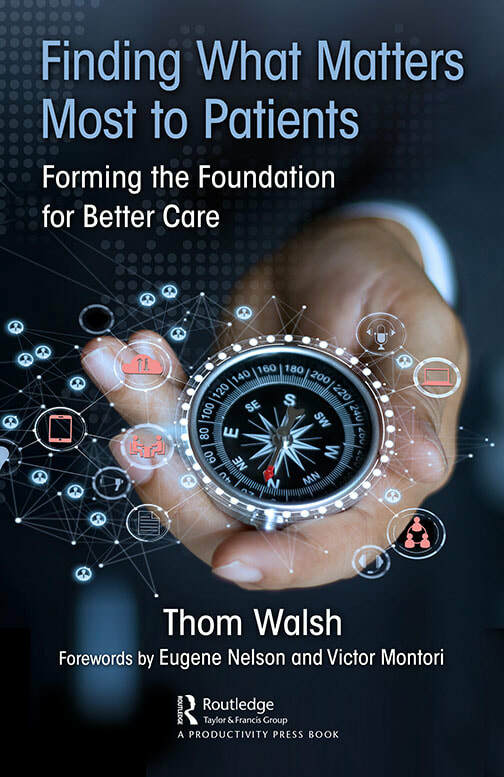 "Walsh specifies practical methods for applying patient-reported measures, shared decision-making, and motivational interviewing to improve their delivery of care. This is a must read for anyone focused on increasing value in healthcare." – Jordan Harmon, MHA, AVP of Value, Hospital for Special Surgery and Director, Costs of Care Inc.